BeDentist – Dentist & Medical WordPress Theme is a responsive theme with a clean design and advanced functionality. Let your users book an appointment right on your website using an appointment form plugin. Create unique layouts in a code-free manner using Power, TemplateMonster’s drag-and-drop page builder. This advanced, intuitive tool comes with multiple layout options and configurable modules providing enormous flexibility. What can help you adapt the design of your site to your corporate identity is a built-in Live Customizer. Pest Busters – Pest Control WordPress Theme will help you to create a noticeable website for your house maintenance business. Almost ready-to use website theme with multiple layouts and pages that will work equally fast on any type of devices. With this theme you’ll get great response rate, intuitive interface, stunning artwork and fully adjustable looks with blogging and social network support. And multiple features, like animated counter and dynamic pages will make your website experience a lot better. And features like pricing tables will greatly ease providing your services. Bimedical- Medical Equipment Responsive WooCommerce Theme is a fully responsive medical supplies WooCommerce theme that will be a perfect match for your nursing equipment website. Being fully crossbrowser compatible, it has an elegant website slider and trendy banners that will help you to present all featured products and items on sale. Versatile product badges, product quick view, and star rating will help you to create a captivating products’ presentation. Meanwhile, a Wishlist & Compare plugin will help your customers to get the best products by laying them aside and comparing them the way they like. 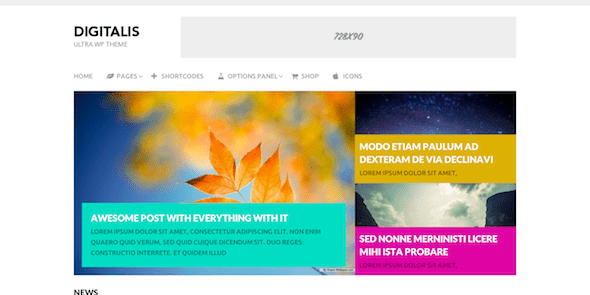 Bridge – Multipurpose WordPress Theme is a cleverly designed theme that is suitable for use in multiple niches like technology, viral news, food, nutrition, health among several others and comes with excellent premium features and optimum performance. Unlike many themes out there, Bridge brings to life the idea of building remarkable site within the shortest time possible. It brings fresh and innovative features that can help turn any average blog into a viral authority site attracting millions of visitors. Diet and Nutrition WordPress theme has been coded for dietician and nutritionist and paediatrician and other similar field websites. However it can be used for other website purposes as well. Homepage is built upon easy to use sections which can be replicated to use at least 20 sections on the homepage to have a lengthy homepage if one needs for landing page. One can easily add content like gallery, testimonials, parallax background sections, and other column content without hassle. Has in built gallery option for adding images of before and after or images of successful client case studies. Complete WordPress theme is complete in each and every aspect and hence we have named the theme as complete as we have tried to cater to multipurpose needs and requirements of clients and web developers who build websites for their clients. So in case you are a doctor or a dentist or a dental surgeon or own a clinic our medical WordPress theme is suitable for you. Medical WordPress theme usually has a section for doctors, a section for blog/news/press releases. Also a section to define about themselves and the services they offer. Also a section for contact us and clearly indicating when the doctor is normally/usually available or clinic timings along with google map. To set up online shop offering a wide range of medical equipment, consider this ready-made template. Medical WooCommerce theme was specifically tailored for offering health products to the target audience. Its clean white and blue color scheme fits medical-related websites, such as business, airlines, social, computers, technologies , etc. Thought-out layout with legible typography and emphasis on images will showcase all products in the most effective way. All items were organized in a grid and provided with pricing details as well as short descriptions, so the visitors will easily choose any they need. Intuitive navigation and wise search will enhance their online shopping experience. This health supplies WooCommerce theme can help you transform your WordPress-powered site into a web store. A lot of white space provides an eye-friendly background that brings interface elements to notice. This design also features many banners motivating customers for a click, whereas sidebar categorization ensures quick navigation through pages with different product types. While scrolling, the front page becomes more dynamic due a custom block with a parallax backdrop. A newsletter signup form will let you get closer to the audience and inform them of promos occasionally. Pages of the theme are SEO-friendly, which will make them easy to find in Google. Professional looking, excellent graphics and functionality of the theme were the three most important criteria. I am learning web development and can find my way around most of the features included with the theme. I am developing an professional level e-commerce site. The only thing I would suggest is that you provide a diagram that explains the relationship between the product/categories, portfolio/categories, post/categories and slugs. SportLabs is a responsive Sport Nutrition WooCommerce Theme that will become an ideal solution for your e-commerce store selling health products, sports supplements and equipment. Its energetic color palette based on red and black colors, and a choice of blog layouts and supplementary pages will also allow you to build a workout blog or an official website of your gym, fitness club, or even online training courses. TechLab is a clean and crispy innovative electronics store Woocommerce theme optimized for readability. Thanks to its intuitive navigation, even first-time visitors will feel the ease of coming across the necessary products worry-free. The theme is designed for electronics online stores. However, a feature-rich theme’s package allows you to tweak the design to fit other business niches as well. Easy installation and management of the template will appeal to both beginner and pro webmasters. Agrilloc is a fully responsive, Cherry Framework 5 based, well-documented, crossbrowser compatible and SEO friendly Healthy Food Store WooCommerce Theme, created for natural food stores. Let your customers collate and lay aside these green products with Wishlist & Compare plugin. Product badges and product carousel provide for an impressive showcase of your organic web shop. Star rating, crossed prices and related products will be very catchy for your clients and will boost your sales. Organica is Cherry Framework 5 based food shop WooCommerce theme. It is suited for selling farming and agriculture stuff, bio active products, and natural cosmetics. This environmental theme is SEO-friendly, ensuring that your website will rank high in search results. Banner ads manager will provide you with the ease of inserting ads and banners in the middle of posts on your organic farm shop.